Korean Martial Arts have two thousand years of history and an abundance of forms. Modern styles are practiced largely across the globe and are probably the most recognizable cultural aspect of Korea. For example, the popular Korean martial art of Taekwondo is one of the most widely practiced martial arts in the world and has grown in popularity to the point of becoming an Olympic sport, with only Judo accompanying it as an Asian martial art form found in the games. Korean martial arts are largely characterized by self-defense, discipline, unity, balance, and control, but with over 25 forms being in practice today, there is a lot of variety in style and technique. The roots of many can be found in Chinese and Japanese martial arts, but have evolved into a uniquely Korean art form. The origins of Korean martial arts are unclear and still debated by scholars, but the practice has been in existence at least since the Goguryeo dynasty, approximately between 37 BCE – 668 CE. Gogoryeo government records mention subak, a general term for barehand martial arts originating in China, and in 1935 paintings on the walls of what are believed to be Goguryeo king tombs were uncovered. A neighboring dynasty, the Silla (57 BCE – 668 CE) learned and spread the subak technique when Goguryeo armies sent aid to ward off Japanese pirates. It is believed that Korean martial arts spread across the Korean peninsula at this time. During the Goryeo Dynasty (935 – 1392), the practice of subak was outlawed by the government as subak matches became a popular gambling event. However, the art form continued throughout the Goryeo dynasty and split into two separate martial art forms sometime in the 14th or early 15th century, the taekkyon and yusul. Taekkyon has recently regained popularity in the past few decades, but the original form of yusul, a Korean version and what some believe to be the origin of the Japanese martial art jujitsu, is now extinct. During the Imjin War (1592-1598), Chinese martial art techniques were again spread to Korea when Chinese armies sent aid to ward off Japanese invaders. King SeonJo of the Joseon dynasty was so fascinated by Chinese martial arts that he ordered people in his court to study a Chinese martial arts manual written by a prominent Chinese military strategist. The techniques studied eventually evolved into Korean martial art styles and Korean martial art manuals began to be published. The most popular, the Mu Ye Do Bo Tong Ji, published in 1790, was an illustrated book that describes Korean, Japanese, and Chinese martial arts in great detail and has been a treasured manual up to this day. With the rising popularity of Neo-Confucianism in the late Joseon dynasty, fighting forms largely lost their popularity. Furthermore, during the Japanese occupation of Korea from 1910 – 1945 the practice of Korean martial arts was banned, and many Koreans instead practiced Japanese martial art forms such as Kendo or Karate. However, the Mu Ye Do Bo Tong Ji along with taekgyeon traditions allowed Korean martial arts to survive through modern times. Modern Korean martial arts are largely a combination of Japanese martial arts and techniques studied from the Mu Ye Do Bo Tong Ji. The most popular Korean martial art form, Taekwondo, has roots in Japanese karate (itself derived from Chinese martial arts), but incorporates many historically Korean techniques. Hapkido is rooted in Japanese Daito Ryu, but is also considered distinctively Korean due to the incorporation of uniquely Korean styles. Of all the Korean Martial Arts, Taekwondo is undeniably the most popular. In 2000, it became an Olympic sport making its debut at the Sydney 2000 Olympic Games. Only Judo accompanies it as an Asian martial art found in the Olympic Games. It is practiced widely across the globe and is South Korea’s national sport. Taekwondo, which is also spelled taekwon-do or tae kwon do, is characterized by kicks and punches. ‘Tae’ means to destroy with the foot, ‘”Kwon” to destroy with the hand, and “do” means an art or way of life. While destruction is a prevalent feature in its literal translation, taekwondo cannot be simply classified as a style of fighting. It is also a self-defense technique, an exercise, a sport, and a philosophy. In competition, punches to the head are strictly forbidden, as are attacks below the belt. Taekwondo was formed as a martial art at the unofficial end of the Korean War, when nine martial arts schools were formed and subsequently united by order of South Korean President Syngman Rhee. In 1955 it was officially named “Taekwondo,” and in 1959 the Korean Taekwondo Association was formed. 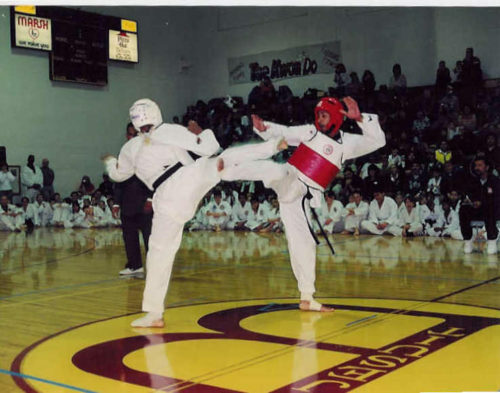 Efforts to standardize the sport were only partially successful, as Taekwondo quickly spread across the world and various methods continued to be taught. Furthermore, the leader of the KTA separated from the organization and created the International Taekwondo Federation (ITF) in 1966. Other organizations were later formed, including the Kukkiwon and the World Taekwondo Federation (WTF). While Taekwondo has its roots in Japanese karate, it has incorporated many Korean techniques found in the Mu Ye Do Bo Tong Ji, and today bears little resemblance to karate. Unlike karate, Taekwondo has developed a comprehensive set of kicking techniques, which characterizes the martial art and distinguishes it from other popular martial art forms. There are 10 levels of rank in the Korean martial art Taekwondo. Like many martials arts, each level has a corresponding belt. While the colors vary widely between schools, the most common, as defined by the ITF, is as follows: white, white with yellow stripe, yellow, yellow with green strip, green, green with blue stripe, blue, blue with red stripe, red, black. Hap Ki Do, or “the art of coordinated power,” is the second most popular Korean Martial Art form which combines aspects of many types of martial arts, including Aikido, Judo, Jujitsu, Karate, and Tae Kwon Do. It is considered a highly effective style of self-defense, teaching defense techniques to counter against common attacks, both unskilled and those taught by other martial arts. Throughout the curriculum, one learns a few attack techniques, but is primarily instructed in the defenses. For example, one will learn how to defend against multiple attackers, or how to defend from a lying position. More advanced hapkido lessons involve defense techniques against weapons such as knives and swords, as well as their usage. Hapkido isn’t as competitive as Taekwondo, and competitions usually consist only of demonstrations. Like most Korean Martial arts, it is unclear where Hapkido found its origins. The founder was Korean by the name of Choi Yong Sul, who was sent to Japan as a child. However, what styles of martial arts he learned in Japan and employed in Hapkido are uncertain, even though most assume he had at least studied Daito-ryu Aikijujutsu as the similarities are undeniable. While Taekwondo and Hapkido are Korea’s two most famous martial art styles, Korea boasts a number of others, of which many hold a large following. Subak and Yusul are the only two styles that are considered lost traditions, while most other traditional Korean martial arts are referenced in lasting manuals from the Joseon dynasty. Many forms of martial arts that are practiced today utilize these manuals as a method of undoing the effects of the Japanese colonization period. Some include Muye 24 ki, Shippalgi, and Kuk Sool Won, each of which claims traditional Korean origins.